The prices are in US dollars Free Shipping On Orders Over $200! Taxes Included! Take 1-4 capsules daily with or without food. 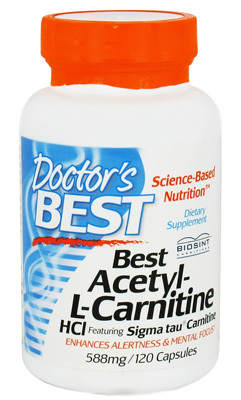 Doctors Best Acetyl-L-Carnitine (ALC) is a naturally occurring form of L-Carnitine, a vitamin-like nutrient synthesized in the body from the amino acids lysine and methionine. ALC plays a key role in the production of acetylcholine, an important neurotransmitter for brain and nerve cell function. The Acetyl-L-Carnitine in this product is derived from a base of pharmaceutical grade L-Carnitine manufactured by patented, FDA-approved process that fully complies with the USP 25, FCC 4 and EU monographs. It is GMO-free, pesticide-free and BSE safe. Acetyl L-Carnitine (ALCAR) is a cognitive enhancer and neuroprotective agent that protects against a wide range of age-related degenerative changes in the brain and nervous system. ALC is an ester of carnitine that modulates cellular concentrations of free coenzyme A and acetyl-coenzyme A, two compounds integrally involved in numerous cellular functions, including the transfer of fatty acids across mitochondrial membranes for energy production. mitochondria which is your cells powerhouse. *Acetyl-l-Carnitine reduces Brown Spots, a universal sign of aging. ALC has been studied for its effect on cognitive performance and emotional health in the elderly. In a single-blind, placebo-controlled trial, 481 elderly subjects taking 1500 mg of ALC per day were found to have improved scores on a memory test assessing cognitive abilities after 90 days of ALC supplementation. In addition to being known for its effects on recognition and memory, placebo-controlled ALC research has also shown better scores in scales measuring the mood of elderly people. Brain function requires coordinated communication between brain cells. Neurons (brain & nerve cells) communicate across tiny cell-to-cell gaps called synapses. The passage of an electrical impulse from one neuron to the next requires a neurotransmitter to act as a messenger to pass signals to adjacent neurons. When an electrical signal arrives at the synaptic junction, the neuron releases a neurotransmitter into the synapse. The neuron on the other side of the synapse contains receptors for the neurotransmitter (that will bind it), triggering a series of chemical events to send a new electrical signal down the membrane of the receiving neuron. Neurotransmitters work together like an orchestra to transmit information throughout the brain and nervous system. Acetylcholine is the most abundant neurotransmitter in the body, regulating activities of vital organs and blood vessels, and communication between nerves and muscles. In the brain, acetylcholine helps to facilitate memory and learning, as well as influencing emotions. ALC is structurally similar to acetylcholine— enough so that brain neurons stimulated by acetylcholine are receptive to stimulation by ALC. In an experimental animal model, it was shown that ALC can furnish acetyl groups to be utilized during the natural biosynthesis of acetylcholine. ALC’s structural similarity to acetylcholine has led researchers to investigate its effects on mental function and emotional health. The acetyl groups donated by ALC can be used to naturally synthesize acetyl-CoA, the key substrate for energy metabolism in the mitochondrion. Acetyl-CoA enters the Krebs cycle, the mitochondrial pathway that generates cellular energy in the form of ATP. Age-related decreases in mitochondrial oxidative capacity are a well-known cause of aging, as the organelles and organs in the body begin to operate less efficiently without ideal ATP production. The effects of decreased mitochondrial oxidative capacity are especially prevalent in organs that require high-energy inputs, such as the brain and heart. Recent clinical studies have shown that ALC helps to promote and maintain healthy mitochondrial function. Phospholipids are structural components of brain cell membranes that regulate neuronal function. ALC has been shown to promote healthy membrane phospholipid metabolism in research subjects. Additionally, the acetyl groups in ALC are naturally utilized by the body to modify the activity of proteins in neuronal membranes. Through these means, ALC promotes normal membrane function, stability, and structural integrity. The body produces specialized proteins called growth factors that are essential to the growth and repair of tissue. Nerve Growth Factor (NGF) prolongs the survival of neurons in both the central and peripheral nervous systems. As we age, our central nervous system experiences a decrease in the binding of NGF to neuron membranes. ALC has shown the ability to promote the maintenance of normal interactions between NGF and neuron membranes. Given to aged rats, ALC demonstrated effectiveness in promoting normal levels of NGF, and it helped maintain utilization of the growth factor in the rats throughout the duration of the study. Maintaining ideal levels of NGF is essential for the health of cholinergic neurons (nerve cells stimulated by acetylcholine), as cholinergic neurons lose some functional capacity due to a lack of NGF. In aged rats, ALC is known to promote the health of cholinergic neurons. In sum, such results suggest that ALC positively influences the maintenance of healthy and normal NGF activity. Several animal studies have revealed that ALC contains many biochemical characteristics that help neurons face the aging process optimally. ALC has been shown to raise levels of glutathione, a key antioxidant, in isolated mouse brain tissue. ALC also reduces blood levels of MDA (malondialdehyde), a free radical byproduct. Furthermore, ALC is a chelator of iron: it acts as a molecule that can naturally sequester iron in the body to prevent iron-mediated oxidative damage to cells. As a whole, data from in vitro and animal studies suggest that ALC is effective towards the maintenance of healthy brain neurons and normal neuronal energetic processes. This hypothesis is supported by human studies that demonstrate the potential of ALC to promote healthy brain function in elderly persons.